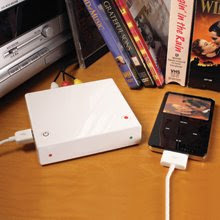 Gadget to put your DVDS, CDS, LPs and Cassettes to Ipod etc. This amazing gadget prized at USD 200 will let you convert all the favorite audio and video you've collected over the years directly to a USB mass storage device such as iPod with the touch of a button. Every form of audio or video media, yes everything that you can think of, can be put on a iPod or a portable Play Station without using a computer or any software. Now, this is what it means by bridging the technology generation gap. Read more here.